Hi, I am interested in your 1968 Chevrolet Camaro (stock #4727-CHA) listed on Autotrader for $39,995. I'd like to get more information about this vehicle and confirm its availability. 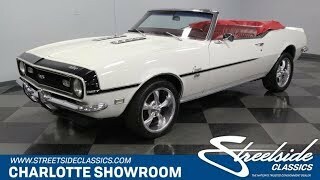 Distinct, iconic, and absolutely fast, this 1968 Chevrolet Camaro convertible is already appealing at its first glance... and thats before you hear the grow of the modern LS V8 power. Ermine White is one of those great Chevy colors that adds sophistication. While thats factory-correct for this car, you can tell by its glossy presentation that there have been investments in this Camaro over the years. The white is the perfect canvas to add all the bold details. This includes bright work on the thin wraparound bumpers, velocity-stack style hood, and upgraded Ridler 17-inch wheels. They add to this Camaros performance appeal, its the cars dark side that really intimidates. The blacked-out SS grille, rear panel, and iconic stinger stripe look terrific. Because the folding roof is finished in black, this is the kind of drop top that even look great when buttoned up. But when you do take the roof down, this classic gets a whole new dimension. The factory-correct red interior looks fantastic against the white, and its also the kind of color that adds to any sporty appeal. So the interior adds another color into the mix, but at the same time, fits in with the cars overall theme. Bucket seats and a center console is exactly what you want on a high-performance classic. This sea of red is completed by the carpeting, door panels, and dashboard. Plus, theres a nice hint of sophisticated wood-like appearance running up the center of the car and on the three-spoke sports steering wheel. You have all the best driver equipment, including the auxiliary readouts in the center console and a Hurst shifter. Plus, the SunTach prominently mounted on the steering column is an instant reminder that this is an enhanced machine. The moment you pop the hood, everyone can instantly tell this classic Camaro has a very modern heart. The 5.7-liter LS1 is a terrific fuel-injected V8 that has earned its stripes in everything from Corvettes to GTOs. It has been correctly installed in the engine bay with all the right supporting components, including an aluminum radiator w/large electric fan and a custom Flowmaster dual exhaust. Plus, you have complete control over this modern beast and its thunderous soundtrack thanks to the four-speed manual transmission. We love the look of the upgraded wheels, they also are the key to allowing for better grip with modern performance tires. This is the kind of project you would want to do if you had the time. But instead this Camaro lets you skip to the fun part with the turn-key upgraded droptop. So if youre ready to show off this weekend, you need to call today!